The W-4 is a Wall mount version of the Infinity Series Rig. It can be customized any way you like: height, pullup bars, accessories. The options are endless. This rack is great for a home gym or Affiliate that needs a smaller Rig. You can customize the depth to 4' and make the front pull-up bar a single for rings if you would like. Please make those selections on the drop downs NOTE: The single bar has an OD of 2"
You can make it a shortie if you don't have the overhead space, drop it down to 7' 6". Please contact [email protected] if you wish to make this customization. Unit must be bolted to the wall. Wall mounting hardware is NOT included. Rogue W-4 - 4' Wall Mount Rig is rated 5.0 out of 5 by 16. Rated 5 out of 5 by PB03 from Exactly what I was wanting My husband and I decided to purchase this for our garage gym. Wanted something that mimics the gym so we were able to crossfit at home when unable to make it to class. This rig is legit! Great quality, very durable, and both of us can workout on it at once if needed. So glad we went with Rogue! Rated 5 out of 5 by Ladder5 from Rogue ready We purchased this for the firehouse and was not disappointed. From service to product it was a great experience. Rated 5 out of 5 by trev21 from Great rig that does it all! I bought this rig 3 months ago for my gf and I and we love it! It is super versatile because we have 3 different heights for pull-ups, toes to bar, etc. We've found we can use 2 sides for kipping pull-ups at once (haven't tried all 3) which means we can workout at the same time! We also have two wall ball targets mounted on both fronts of the rig. By installing this rig we expanded the types of crossfit workouts we can do. The j-cups that also come with this rig are great and don't mess up my barbell. Overall this is my favorite rogue purchase. 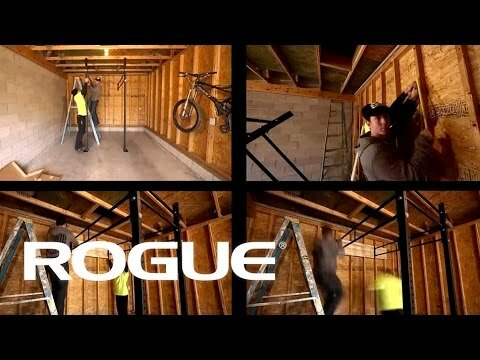 Don't be afraid to email rogue and customize the pullup bars you want included with the rig. Rated 5 out of 5 by Robert210 from Great value I bought his for my wife, she works full time and we have 3 children so the time and money we save on not having to go to a gym after work or pay for the membership is just great. She can come straight home and work out when she wants without having to worry about making a class and what you would spend in 4months on a gym membership is now her own gym. Sturdy - practical - easy to assemble - all in all great buy. Rated 5 out of 5 by randallwise from Amazing Quality, worth every cent! I wanted to upgrade from my squat rack into something that was more versatile for my garage gym. I chose the w-4 wall-mount so multiple people can use it as once (my kids, wife, friends, etc.). I chose the x-70 beam to hang my heavy bag, rings, and other accessories, the dirty south bar so I could have a lower height for my wife/kids, and the 2" fat bar in the front. Safety spotter arms, matador, kids bar, and landmine round out the purchase. This is by far the best investment I've made. Installation was not complicated, although you do need to know a bit to get the ledger up correctly. I can't stop looking at the beauty of this beast of a rack. If you're on the fence, stop, and buy NOW.